Delivery is guaranteed within a maximum of 5 days from the day of the order. (50% of deliveries are dispatched 2 or 3 days). The driver will carry the product into the premises to a storage point of your choice. A minimum delivery charge applies. The sizes/products listed above are just a part of the range we have in stock. This range is always being increased and changing all the while. Contact our sales team for details of new sizes/products. For 2mm sheet, 2mm float, 2mm semi difused, 2mm non reflective, 2mm Silvered float, 3mm silvered float, 4mm silvered float with a 25mm bevel. This is a rolled glass in 1.8mm thickness. They are packed into 1000 kgs crates, but we do offer less than crates quantity's the glass is paper is interleaved between each piece of glass and wrapped into parcels of about 10-20 kgs per pack. The crate weight is about 1000 kgs. Sizes available at present are as follows: 3.5 x3.5, 5x 3.5, 5x4, 5x5, 6x4, 6x5, 7x4, 7x5, 7x6, 8x6, 8x8, 9x7, 10x4, 10x7, 10x8, 10x10, A4, 12x8, 12x9, 12x10, 14x10, 14x11, 15x12, 16x11, 16x12, 18x12, 18x14, 20x8, 20x16, 24x18, 24x20, 28x22, 30x20, 32x22, 36x24, 300x240mm, 400x300mm, 500x400mm, , 600x500mm, 700x500mm, 800x600mm, 1000x700mm. These are generally used by the volume contractor. This is made by the float process in a 2mm thickness. They are packed in crates of around 215 sq/m per crate, 1000-1300 kgs per case. 48x36 paper interleaved, below are also paper interleaved please note just some of the standard sizes (Ask our sales team for details of sizes are in stock ). Sizes available are 10x8, 12x10, 14x11, 16x12, 20x16, 24x18, 24x20, 30x20, 36x24, 48x36,And more 1680x1040mm, 1840x1220mm. Float glass is generally used by the "High Street/Gallery" framer or by the contract framer for high quality work. This reflects a maximum of about 5% of the light backs. They are packed in 160 sq/m to a crate. Sizes available are 1220x920mm. This is used for the higher quality work and it is generally used by the "High Street/Gallery" Framer. These are available in stock sizes ,We will also do cut to size on request in any quantity . At present only one size is available, 1840x1220mm but we can cut this to the customers requirements in any size or quanitiy. These are packed in 185.8 sq/m to 200 sq/m to a crate, papered interleaving and made in the uk . Sizes available are 10x8, 12x10, 16x12, 18x12, 20x16, 24x12, 24x18, 24x20, 30x20, 36x12, 36x24, 40x30, 48x12, 48x24, 48x36. These are packed onto pallets of 1000kgs or any quantity required. M.D.F. is smooth on both sides (S.B.S). Sizes available are 6x4, 6x5, 8x6, 8x8, 9x7, 10x8, A4, 12x10, 14x10, 14x11, 15x12, 16x12, 18x14, 20x16, 48x36, 300x240mm, 400x300mm, 500x400mm. These are packed onto pallets of 500 kgs. Sizes available are 24x12, 24x18, 24x20, 30x20, 36x12, 36x24, 40x30, 48x12, 48x24, 48x36. These is normally keep in stock in the size of 96”X48” (2440 x 1220mm) but cut to customers sizes in house as and when required. This is only available in one size, 48x36, 2.35mm thickness. They have a slight bow to flatten artwork and are lightweight. We stock the mark-3 which has a wax coating on one side . These are for the corners of the frame to protect the corners and to give a presentation of a quality product. These are for photo frames to help them stand up (available in either standard leg or 18mm extended). You may Not require full crates/pallets of a product, we can make a crate/pallet of mixed items. For minimum orders see "Delivery" or contact our transport department. If you require any of the above products in sizes that we do not do not stock, we can cut to your requirement. 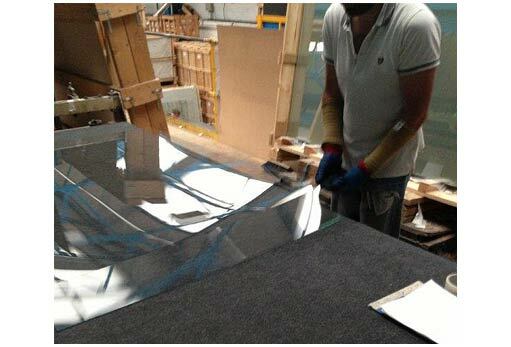 We have three "mini square cuts" (Glass Benches) to cut up float, and non reflective glass, 3mm, 4mm, silvered float mirror. We have a panel saw to cut up 1.8mm/2.3mm/3.2mm M.D.F. also plastic glass in most thickness's . We also can help with advice with any product you may need to for fill your requirements.